On Dec. 18, 2018, Netflix released a new movie called “Bird Box.” This movie had audiences going crazy because of the plot of this film and even inspired fans to take on a challenge. “Bird Box” was adapted from the book by Josh Malerman. Academy Award winning actress Sandra Bullock stars in this film as Mallorie, who is a painter and lives with her sister Jessica (Sarah Paulson). This is a different role for the Bullock, who tends to star in more drama films. She fits the role well with her great facial expressions throughout the whole film by putting great emotion into the scenes. Bullock makes audiences question what will happen next. The movie starts out with Mallorie painting in her house. She is pregnant and Jessica takes her to the hospital. Mallorie starts to see some people doing crazy actions throughout her town. Events transpire, and Mallorie finds herself looking for shelter. She eventually meets a group of people holed up in a house with a man named Douglas (John Malkovich), who comes off as suspicious, and other people trying to stay calm. Audiences are brought into action right when the film starts because Mallorie is showing great emotion because phone lines go out and there is no internet. The group of people all try and work together to figure out what these monsters are and what they have to do to survive. Eventually, Mallorie is on her own and has to find a way to find shelter. One of the gripping aspects about this film is the back and forth between past and present to explain the plot. Throughout the movie, the viewers are brought right into the action, but then it cuts to the past to start explaining. It really entices people to keep on watching. The movie had you question what was going to happen next and about the characters in the film. For example, one man who is let into the house by Olympia (Danielle Macdonald). He appears to be suspicious to some of the characters in the story. Many people also try and figure out what exactly is going on. Mallorie’s quotes keep people worried about what is going to happen. Mallorie makes it seem like she hates Boy and Girl, but she just wants to protect them. For example, when she is getting them ready to leave for the long trip, she puts a lot of emotion into what will happen. This really makes you be at the edge of your seat. The climax of this film makes you worried for the characters themselves because of what is happening. The ending has shocked some people. Some even got mad at the ending. This movie inspired people to do the so called “Bird Box Challenge,” which meant to blindfold yourself and walk around your house. 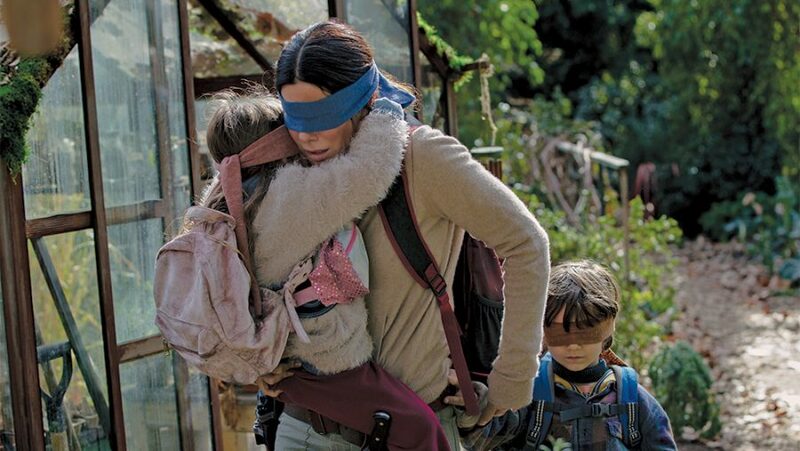 Throughout the film, “Bird Box” left its viewers wondering what was going to happen next. With a thriller movie like this, it may be in the running for an Academy Award.